The Tennant T5 is yet another great example of quality. 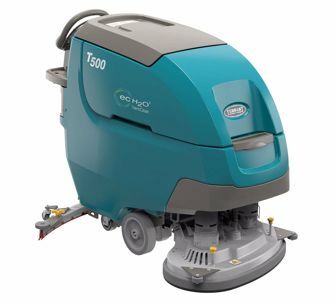 American made and backed with the best warranty available in the industry this machine is designed to effectively clean the floor in a single pass. Tennant has outdone themselves yet again with the T5 becoming one of the best selling walk behind commercial floor scrubbers on the market. Note: There is an updated version of the Tennant T5, now called the Tennant T500/T500e. Learn more about the Tennant T500/T500e. The T5 varies in size, with scrub decks ranging from 24 to 32 inches in width. You can purchase this walk behind floor scrubber with either a cylindrical or disk styled scrub head depending on your application. Equipped with a parabolic squeegee the T5 does an exellent job at picking up water. Given that this machine is constructed with polyethylene tanks, cast aluminum scrub heads and squeegees as well as other quality components the T5 will not rust. The electrical system is wrapped in kevlar with water tight electrical connectors protecting your machines electrical integrity. Should this be the right machine for your application, you will be very satisfied in its productivity.